Phil Ryken both brings out the key themes of these three sections and illustrates how they come together in their focus on the gospel of Jesus Christ, especially his kingly and prophetic offices. 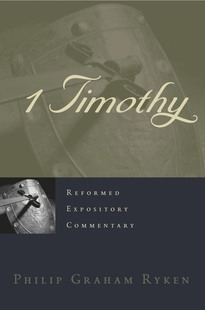 This is an excellent resource for those who want a devotional aid and will help Bible expositors reliably teach a redemptive-historical view of this important Old Testament book. As are all the books in the Reformed Expository Commentary series, this exposition of 1 Kings is accessible to both pastors and lay readers. Each volume in the series provides exposition that gives careful attention to the biblical text, is doctrinally Reformed, focuses on Christ through the lens of redemptive history, and applies the Bible to our contemporary setting. "Sadly for many North American Christians the Old Testament is a dead book, often treated merely as a foil against which to interpret the New Testament. Phil Ryken’s work goes much, much farther. This volume is a model of exposition, combining thorough and responsible exegesis with a passion to communicate the life-giving power of Old Testament Scriptures for the church." "Ryken finds himself on the short list of highly-gifted expositors in this generation. He has done the church an enormous service by providing this excellent resource for pastors and teachers to aid in their sermon and lesson preparation. It is clear, compelling, scholarly, pastoral, challenging, heart-searching, and life-changing. I cannot imagine preaching through 1 Kings without first consulting this important work." "With his usual deft touch, Ryken makes the narrative live; and with rare pastoral skill he applies its truth with vigor. Be prepared to find yourself troubled by the perversity of human nature and frustrated by the cycles of human foolishness. But be prepared, also, to find yourself amazed by the majesty of the God who in every age and stage leaves a witness to Himself."